If your Dad would prefer to spend weekends at one of the awesome craft breweries we have, then this bundle is perfect for him! Our two mustards are made with beer from Green Bench Brewery. Sweet German will be sweet with some spice, and the Spicy Stout will bring the heat with chili flakes and black pepper. And while they're sipping on their favorite beer, Habanero Dills will hit that spicy, snacking spot! Give your Dad something to snack on when he opens the fridge! This combo of pickles hits all the flavors he could ask for. Our Chili Brussels, will make even a brussels sprouts hater fall in love with it's super savory cumin and chili pepper (seriously, they're that good). Sriracha Okra, is full of sweet smokiness, with a little bit of heat, and essential in a Bloody Mary. Finally Habanero Dills, bring some REAL heat and the perfect amount of garlic. We'd like to see him eat more than one at a time! This is for the Dad who says there's never too much heat! We rounded up our spiciest preserves to make his tastebuds dance. Again, we have Habanero Dills (we've never met a Dad who DIDN'T love these), they are definitely our spiciest preserve and and spice lover will eat these up! Pear Habanero is a wonderful jam that is the perfect balance of sweet and spicy. It also happens to be amazing for grilling any and all kinds of protein. Top it all off with our Spicy Stout mustard and your spice guy is going to be satisfied! Not all Dads prefer savory or spicy things! These jams are for the Dad who prefers all things sweet! We rounded up our sweet and delicious jams, that are great for morning toast, quick PB+J lunches, or in an after work cocktail. Caramel Apple will remind him of his Mom's apple pie, while Peppered Strawberry is fresh and sweet, and Chai Grape will brighten his mornings. We hope you find these bundles helpful! Mom's deserve more than just flowers on their big day, and let's be real, you all are foodies, so we have have a good feeling your Mom's are too! We put together different trios of preserves you can bundle for your Mom based on her specific tastes. P.S. But be sure to scroll to the bottom for exciting news about a special Mother's Day Jam to be released next week! If your mom has an undeniable sweet tooth, delight her with our sweetest jams for her morning toasts, ice cream, desserts, and so much more. Caramel Apple + Sea Salt, Blueberry Lavender Vanilla, and Chai Red Grape are just some of our favorites! Some like it hot! So if your Mom falls into this category, delight her taste buds with a collection of our spiciest jam, pickle, and mustard. 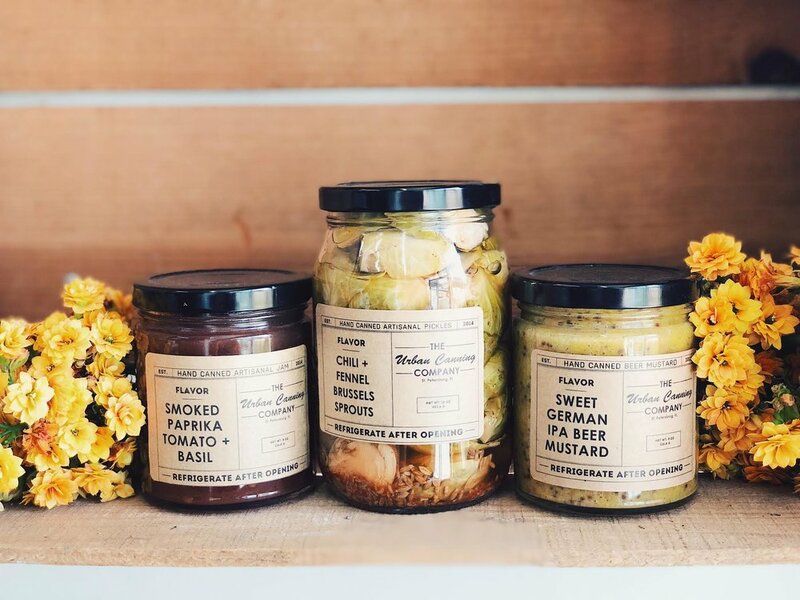 Garlic Dill Habanero Cucumbers are sure to bring the fire, Pear Ginger Habanero jam will sweeten and burn to perfection on a goat cheese log with crackers, and our Spicy Brown Stout Beer Mustard will make a tingly dressing or sandwich topper! For the Mom with that sweet + salty combo taste, we recommend our sweet and slightly savory Smoked Paprika Tomato + Basil jam. Adding on our savory Chili + Fennel Brussels Sprout for a salty snack crunch, and our Sweet German IPA Beer Mustard for a sweet and spicy kick, will be sure to hit all of her favorite flavor profiles! Maybe your Mom likes to get out there and learn new things! We created a special class on Mother's Day for the special lady in your life. It's also a fun class to take with her for some Mother/Daughter time (hint, hint). We'll be learning how to make a delicious cashew nut cheese, and blueberry jam. The afternoon will be spent cooking, snacking, and laughing. You can purchase tickets here! We're so inspired by our Mom's we couldn't let this holiday pass without making a special jam just for her. Next week, we'll be releasing our limited batch Mother's Day jam: Chocolate Bouquet Jam!! Filled with fresh blueberries, our favorite Pinellas Chocolate, and flower buds, we think your Mom would feel pretty special opening this up on Mother's Day! Grab this delight starting next Tuesday in our tasting room and market next week, OR preorder now for shipment by Wednesday 5/9 (cut off for preorders will be Monday 5/7)! 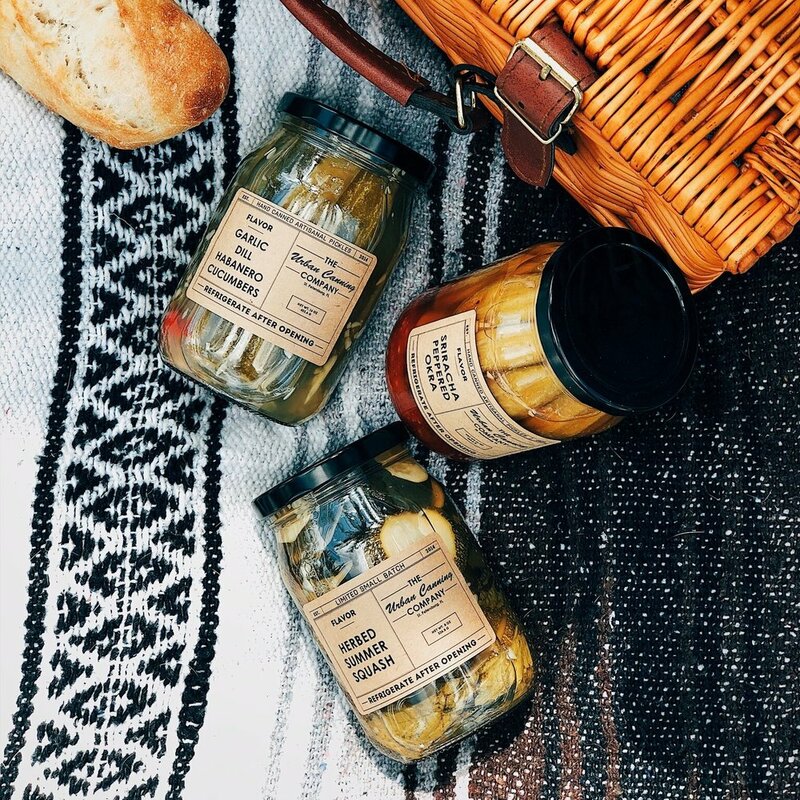 Make Your Best Picnic Ever! It's one of our favorite times of the year where it's warm and sunny, but still cool and breezy enough that you want to be outside ALL the time. 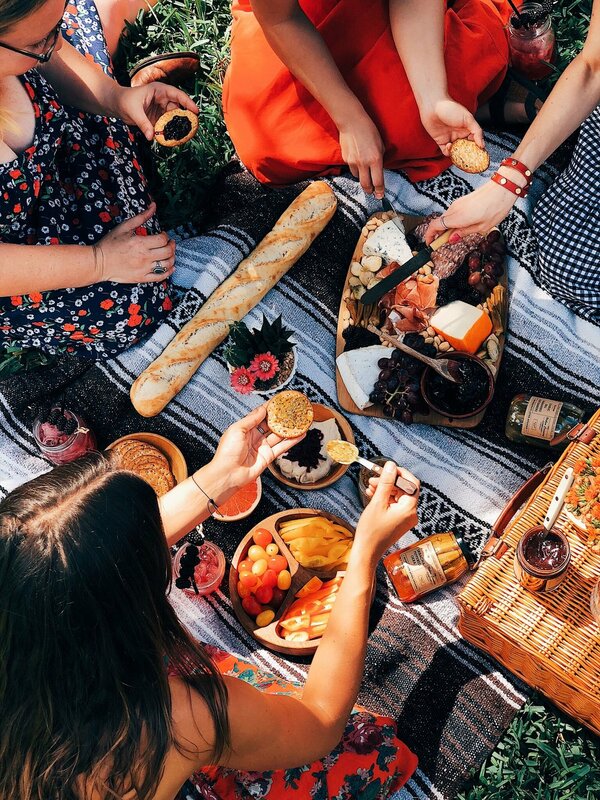 This weather has had us inspired to get together with our friends and create the best picnic. How strong is your picnic game? If it's been a while since you've gathered for one, we have our three top tips to get you planning! Ok, this goes without saying, but sometimes it's hard to know what to pack when you're going to be eating on the ground. Our answer is: finger food, and lots of it. Snacking is one of the easiest ways to enjoy a meal with friends, but also be portable too. And you're in luck, because this is our specialty. We brought along some of our standard favorites like Sriracha Peppered Okra, Chili Fennel Brussels, and Garlic Habanero Cucumbers. 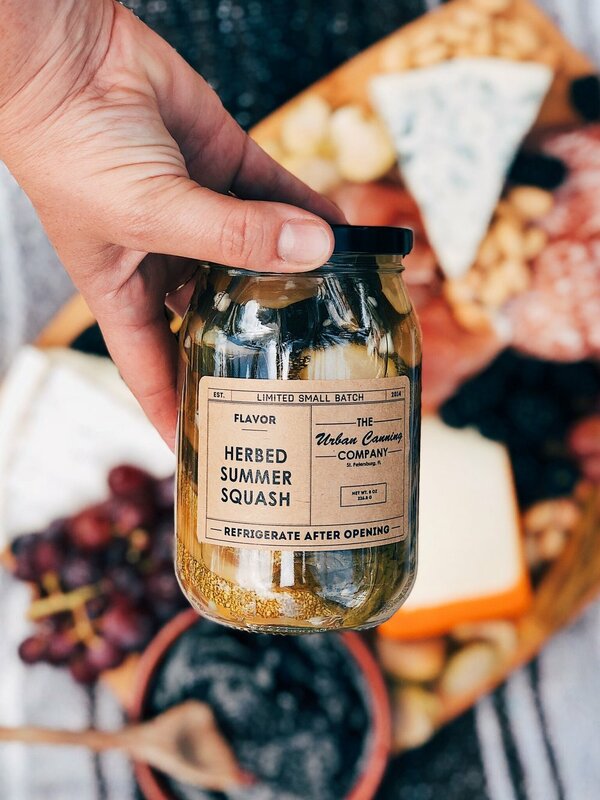 For a little seasonality, we also brought along Herbed Summer Squash (limited batches at markets and in-store now). Gather different cheeses, meats, jams, nuts, fruit, crackers, and our German IPA Beer Mustard to make a beautiful but simple charcuterie board. If you're new to cheese and meat boards, we can help you learn how to build a board to perfection! Another one of our favorite picnic snacks to bring are cheese logs. We love a good cheese smothered in jam and topped with fresh herbs and nuts. You can check out a couple recipes here and here for ideas. You obviously can't enjoy good food without good drinks! We love a fizzy spritzer on a warm and sunny day. Have you tried our Blueberry Lavender Jam Gin Fizz? Because if not, put it on your list to bring. It's cold, refreshing, and dare we say, one of the easiest drinks to make! P.S. You gotta try our Strawberry Balsamic + Cracked Pepper jam in drinks and with goat cheese. If you want to stick with water, don't go plain. Add some fresh fruit and herbs to your water pitcher a couple hours before your picnic for infused water! We have some mouthwatering infused water recipes here. The most important element to the best picnic ever, is friends. Food and drink don't matter as much when you have your best friends by your side laughing and catching up. That's really the sweetest part of life right? Let's celebrate this weather, our friends, and the opportunity to nosh on some good food. Florida Blueberry Season Is Here! The only thing that makes Florida strawberry season ending feel better is that Florida blueberry season begins! We are just at the very beginning of the season and we have been checking in on our favorite farmer, Sue at Blues Berry Farm, all year long and holding our breath for word that the blueberries were coming, and now they are! This past Wednesday I came out to pick up our first harvest of blueberries from the farm! Sue always takes me up and down each row teaching me about the different varieties she's growing, details about their sustainable farming methods and which blueberries are ready for the picking! I can't tell you all enough how amazing it is to work so closely with our blueberry farmer. After the blueberries are harvested I bring them back to the kitchen for processing and they are canned into jam the very next day! I can confidently say our Blueberry Lavender Vanilla Jam is one of the freshest jams around! So I'm jumping on the over night oats bandwagon here with this quick breakfast recipe! I'm not going to lie I also put this together because I like to eat pretty food, although I will say that over night oats are great to keep in the fridge for mornings you might be in a time crunch. After making these jars-o-deliciousness the crew all ate them and said it tastes like a cross between a PB+J and an ice cream sundae. I ain't mad at that! In a mason jar I added the oats, almond milk and maple syrup. I placed the lid on, shook it and put it in my fridge over night. The next day in another mason jar I began layering yogurt, the oats mixture, Strawberry Balsamic + Cracked Pepper Jam and graham crumbles! I repeated this until the jar was full! Top the jar with a fresh cut strawberry, almond or cashew butter and remaining graham crumbles!